Adderbury were crowned champions after beating Carterton in the final of the Hawker cup, played at City and County. The rink of Ian Dunn, Nigel Eley, Chris Skidmore and Ted Eley faced a Carterton rink comprising of Peter Latter, Kevin Salway, David Clanfield and Remy Clanfield. The game began in Adderbury’s favour seeing them take an early 8-0 lead after 5 ends. Carterton did not take the lead on the rink until the 13th end, score at 13-12. With the score at 17-14 the tooners looked fairly safe, but big 2 shot pickups on the last 2 ends see the Adderbury rink pip the lead 18-17. The other Adderbury rink of Mick Jelfs, Paul Jelfs, Phil Gladden and Darren Sharpe took on Carterton’s Paul Justin, Phil Monahan, Tim Jupp and Paul Sharman. This game saw the reverse with regards to scoring, with Carterton going 7-0 up after 4 ends. Adderbury then came back strongly, to take the lead 10-9 after 11 ends. The game was then tied at 15 shots apiece before 2 singles on the last 2 ends see Adderbury over the line 17-15 victors. The overall score 35-32 to Adderbury. Congratulations to Adderbury and commiserations to Carterton for a valiant effort. 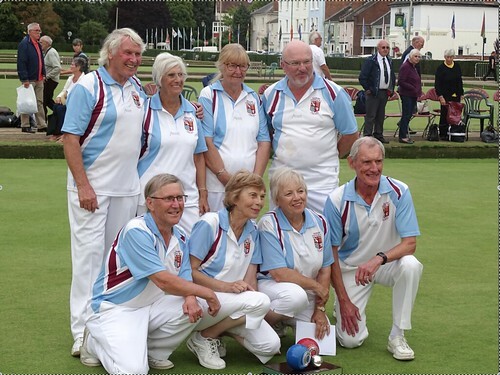 A big thanks once again to everyone at Oxford City and County Bowls Club for hosting such an excellent competition. Congratulations to Paul Comley & Colin Whitehead who won the Bowls England National Men’s Senior Pairs Competition, supported by the Friends of English Bowling, at Victoria Park, Royal Leamington Spa. 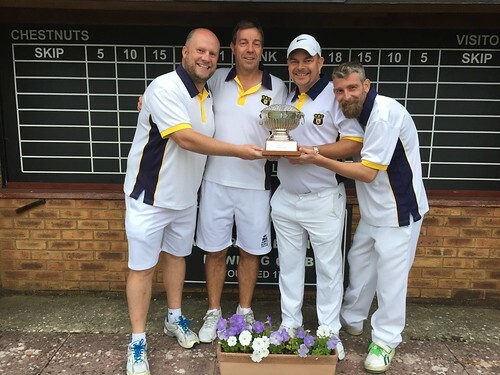 The Headington duo defeated Cornwall’s Ronnie Thomas and Kevin Williams 24-7 in Sunday’s final. The victory ensured that Colin joins a distinguished group of people to have won both the Men’s Senior Singles and Senior Pairs, following his success in the Men’s Senior Singles in 2010, in a game which will be remembered by those of us who were present, for the horrific wet and windy conditions down at Worthing. 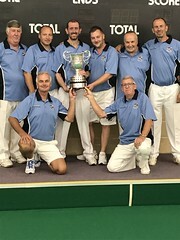 In the Sunday mornings semi-final, they secured a 24-10 victory over nearby Buckinghamshire rivals Neil Farnish and David Simpson from Gerrards Cross BC. On their way to the title, Colin & Paul had comfortable wins against pairings from Huntingdonshire 28-11 in the first round, a second round 28-2 win against Lancashire and a 21-16 quarter-final success against Lincolnshire. This Sunday’s Hawker Cup semi finals and final will be hosted at Oxford City and County bowls club. Semi finals will commence at 09:30. The final and third place play off will be played in the afternoon.